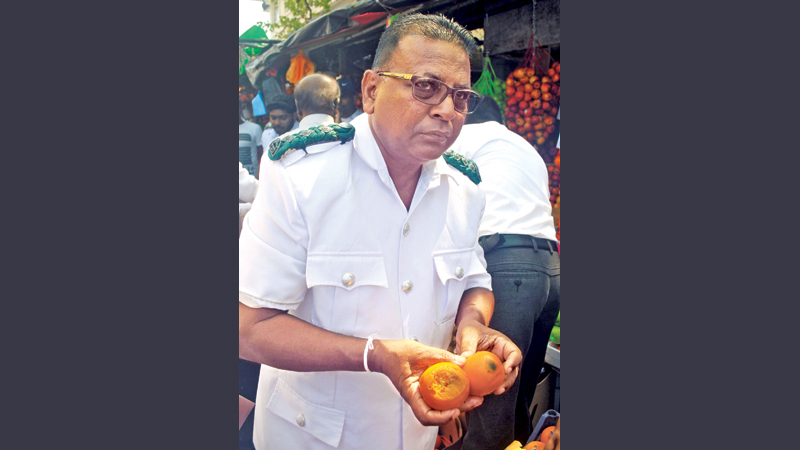 An officer shows rotten fruit found during a raid of the Pettah fruit market, recently. Picture by Siripala Halwala. The Colombo Municipal Council (CMC) has intensified food raids since last month and would continue them until mid-April, medical officer-in-charge of the City Food Safety and Hygiene Promotion Unit, Dr. Subash Mendis told the Daily News yesterday. Several raids were conducted from April 1. Recently, wholesale shops in Pettah and Colombo Fort were raided, during which around 65 shops were inspected, he said. After detecting various serious shortcomings, legal action was taken against 21 shop owners. Unhealthy food items were destroyed. The same programme will be implemented in May in order to ensure the hygiene of all dansals, he said. The raid was part of the CMC’s special food inspection programme which was launched under the instructions of CMC Chief Medical Officer (CMO) Dr. Ruwan Wijayamuni, during the festive season. Dr. Wijayamuni, six Medical Officers of Health (MOH) and 40 Public Health Inspectors (PHI) conducted the raid, he added.